If your CF card was reformatted, Flash File Recovery still recover the data file back from the formatted memory card. 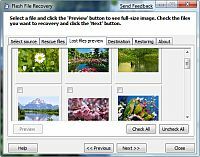 The formatted images, videos, or any other multimedia files can be only recovered by using an advanced Card Recovery application. This file Recovery software will start a professional data recovery process immediately. CF restore software is capable to recover deleted picture, image, photo, audio, video clips and word files from Compact Flash, mini SD, micro SD, SDHC, SDHC plus or PC card even error message "Drive Not Detected" is displayed on computer screen. Utility was developed to restore deleted documents even if the files deleted by using Shift Delete keys from any brands of memory cards such as: Sony, Sanyo, Kodak, Olympus, Umax, BenQ, Casio, Lumicron, Konica and many more. It is safest and easiest solution for your lost files. This easy to use utility does not require any technical skills to operate it. The software is completely non-destructive as it does not makes any changes in the original data stored on the card. Recover you format memory cards the Flash File Recovery is a good choose!